Linden Hills UCC is collecting backpacks and school supplies for children who have a father incarcerated at Lino Lakes Prison. The dads are leaders in BRIDGE Partners at Lino Lakes. They are working to build connections between prison and the community by building their leadership and being role models in bringing positive change to the community beyond prison. HOW YOU CAN HELP. 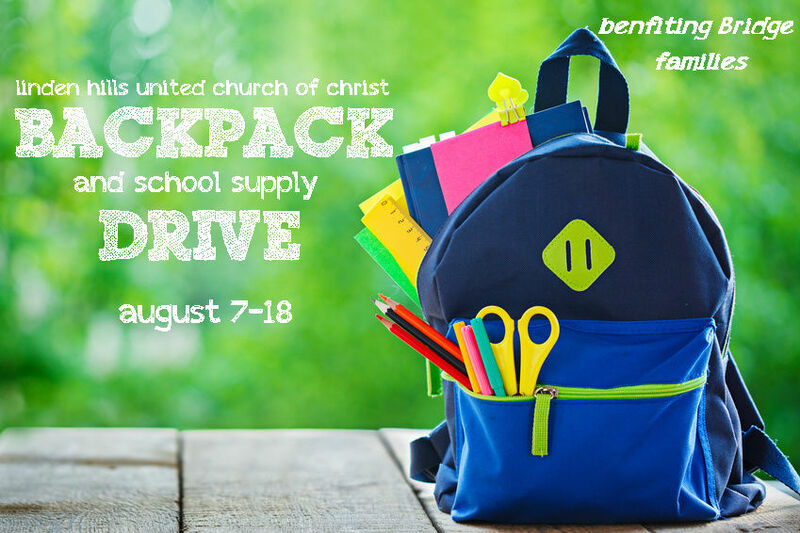 Our goal at Linden Hills UCC is to provide 8 fully supplied backpacks to children K-12. We need 150 individual items. Please contribute funds by going to http://bit.ly/lhucc_giving . With your support we can do the shopping and meet our goal! Items must be packed and ready for distribution on August 18th. Thank you! for Racial Justice, and families with incarcerated loved ones to build a bridge from prison to the community. Hear from people most impacted by our system of incarceration and from community leaders. Learn about how your participation in voting and policy change matter. Connect with others who want to build a growing BRIDGE community.